A book about the bacteria living on and in the human body, and how the human race is being affected by the overuse of antibiotics, may not strike you as a page turner. 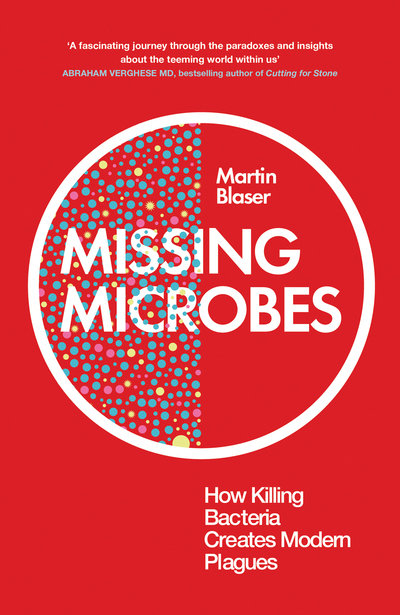 Delve into Missing Microbes by Martin Blaser, and prepare to be surprised at how gripping these tiny creatures can be. The premise of the book is that antibiotics, thought to be relatively harmless, are having an affect on our collective wellbeing. Blaser introduces the concept of the human microbiome, referring to the menagerie of bacteria that we each carry within us. However, with mass administration of antibiotics, the diversity of the microbiome has suffered. Relatedly, he argues, the rise of Caesarean sections has resulted in babies not receiving the microbes that they are supposed to obtain in a natural birth, also having deleterious effects on the microbiome. Blaser argues that the reduced diversity of the microbiome is linked to a number of modern maladies, including obesity, allergies, asthma, type I diabetes, heartburn and (speculatively) autism. Blaser peppers a hearty amount of evidence with anecdotes and analogies to make his points relatable. He uses the results of much of his own research using mouse models, but also makes many references to literature by others in his field. He explains the essence of each concept, so you do not miss out on the details if you do not have a background in biology. However, I think it would also be enlightening to those who already know the basics, as he makes some original points that may seem to contradict what your training would present as fact. The book is beautifully written and intensely interesting. Some of the points that Blaser made seemed more speculative than evidence based, and this is where the book could perhaps do with some refinement. In most instances where Blaser makes a claim that is underdetermined by the evidence, he openly admits that there may be another explanation, that further research is needed and that he is making the point on a hunch. However, there are a few instances in which he insists on connecting dots which are not necessarily connected. For instance, on page 188 he boldly writes that the fact that two bacterial infections, C. diff and MRSA, are both spreading into the community (when previously the infections were found chiefly in hospitals), are not responsive to antibiotics, and have arisen at the same time "tells us that our human microbial ecology is undergoing dramatic changes". Seeing as he himself argues that plagues are a routine consequence of people living in towns and cities, I suspect that the simultaneous existence two devastating infections is not sufficient proof for the point he is making. Regardless of this minor point of criticism, I found this book to be enjoyable and endlessly engrossing. Next time you are inclined to read a horror story, pick up Missing Microbes and learn about the terror unfolding in your body right now.